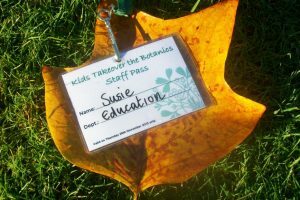 The Royal Botanic Garden Edinburgh (RBGE) is delighted to be the first garden ever to take part in the national ‘Kids Takeover the Museum Day’ on Thursday 28th November 2013. We are pleased to be working with pupils from Broughton Primary, Leith Academy and Prospect Bank School. The Takeover Day has been running in England for the past 10 years but this year sees its launch in Scotland. The idea behind the Day is to give children and young people meaningful roles and for the organisation to learn from the young people themselves. Available roles range from horticultural jobs; working as assistants in the café and restaurant; carrying out the duties of the Visitor Welcome Team; inputting ideas into products for the Botanics Shop; taking over the social media and official photography for the day; developing trails; writing for the magazine and helping in the library. Pupils have studied the job descriptions of various roles and have written mini CVs to help them decide which job they wish to do. We hope that the experience increases the pupils’ confidence in the world of work and gives them a better understanding about the work of the RBGE – what goes on behind the scenes! We also hope that they will share their own expertise, giving RBGE a better understanding of what young people want and producing trails and publications that we can use as part of our visitor welcome. All pupils will gain a certificate to say they have taken part and will write a report to go into the Botanics magazine in 2014. We hope that some of you come along to meet the young people and enjoy their enthusiasm and energy!